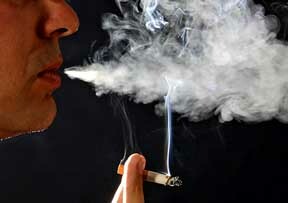 11 July:Smokers will have to take recourse to the streets to have a puff as the Centre has decided to ban smoking in public and private buildings from 2nd october. Addressing a gathering on World Population day, Union Minister for Health Anbumani Ramadoss on Friday said smokers will be free to smoke only on roads and streets, not at private and public buildings. "Smokers can have a puff at the risk of their health in private in their bedrooms provided they had the permission of their wives," Ramadoss said, adding that smoking in public and private buildings would be banned from October two. Asked about the Centre not giving sanction to the state government to open three medical colleges for which the Bihar Health Minister N K Yadav made a fervent appeal, Ramadoss said that a team of Medical Council of India (MCI) visited the state recently and found that infrastructure provided by the state government for opening the medical colleges was not up to the mark . A central team was then dispatched to make on the spot survey of the sites earmarked for opening of new medical colleges and the central team too found that the infrastructure provided by the state government was not up to the mark and hence the medical colleges were not sanctioned. This is all paper work, i am from chandigarh and our admnistration claiming chandigarh is smoke free, but if you go in the market you will find so many people having cigrate and bidi. who will check them ——-?